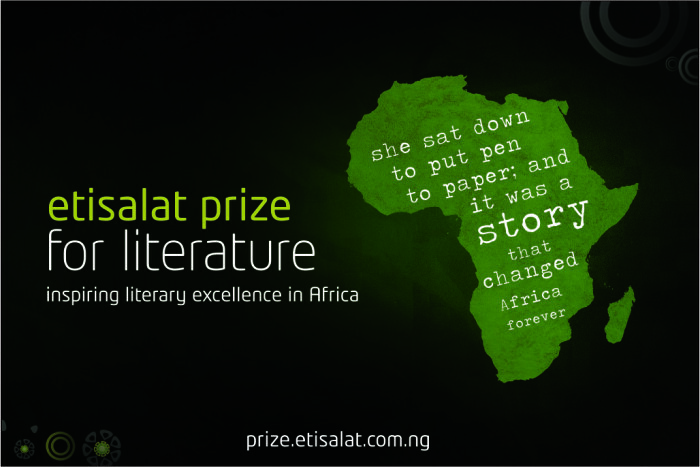 Entries are now accepted for the Etisalat Prize for Literature 2016. The Prize celebrates new writers of African citizenship whose first fiction book (over 30,000 words) was published in the last twenty four (24) months. For the purposes of this definition, first book means first printed production in book form of any type or genre. The Etisalat Prize for Literature is unique in that it also aims to promote the publishing industry at large and will therefore purchase 1000 copies of all shortlisted books which will be donated to various schools, book clubs and libraries across the African continent. Authors and their publishers can be based anywhere in the world. In line with Etisalat’s vision of promoting upcoming writers, they will sponsor a book tour to three African cities. The winning writer will also embark on the Etisalat Fellowship at the University of East Anglia mentored by Professor Giles Foden (author of The Last King of Scotland) which will include significant opportunities to meet other writers, publishers and most importantly work on their second book. The application form should be submitted along with seven (7) copies of the published book to the Etisalat contact address.